Remote Light Control is designed to operate lights. For use with Polarized Outlets Only. 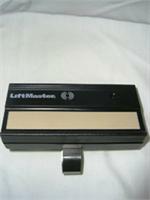 Use with Chamberlain / Liftmaster390 MHz remote Security + remote controls and keyless entries. Simply plug the light control into a 120 VAC polarized outlet, press and release the"learn button" on the Light Control, within 30 seconds Press and hold the button on the hand held remote. For indoor use only.